Sliding the door contact ON and OFF switch (1) to the left activates the automatic control for the interior illumination. Sliding the door contact ON and OFF switch (1) to the right switches off the automatic control for the interior illumination. Pressing the dome lamp ON and OFF switch (2) switches the left and right front dome lamp (3) in the overhead control panel on or off. Pressing the left reading lamp switch (4) switches the left reading lamp (6) on the underside of the inside rearview mirror unit on or off. 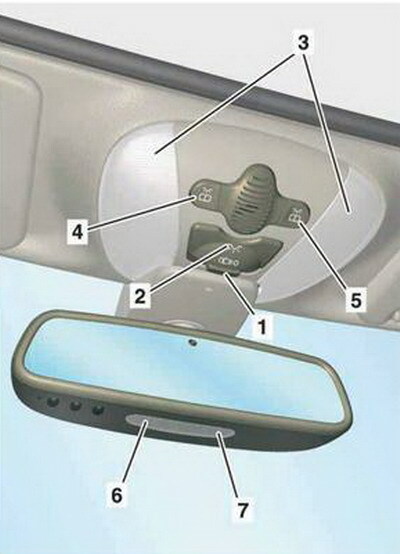 Pressing the right reading lamp switch (5) switches the right reading lamp (7) on the underside of the inside rearview mirror unit on or off. 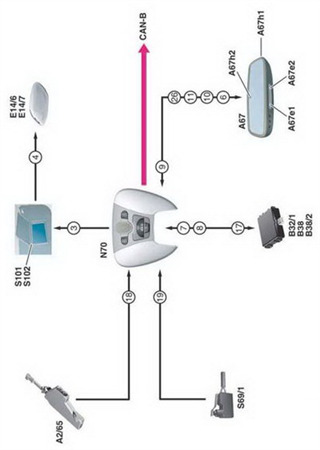 In this section we add some useful information about some Mercedes Benz 30 OverHead Control Panel System and it features.